In our October edition of our Preemie Family newsletter we learned about Cooper & Cohen Pella, who were born at 23 weeks and 4 days, weighed in at 14.8 oz. and 15.4 oz. respectively. 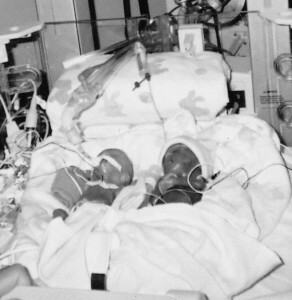 Cooper was in the NICU for 134 days before going home and Cohen passed away on the day of his birth. Read more in an update by their mother, Tracy, below. My husband and I had no idea what parenthood had in store for us. After a few months of trying to get pregnant, we were elated to learn we were pregnant. At only 6 weeks in, we learned that we were having twins. Besides morning sickness and the normal aches of pregnancy, things were moving along. Our lives changed forever on June 1, 2011.At a routine doctor’s appointment, it was discovered that one of the twins was in distress, within 10 minutes, I was in surgery and had an emergency C-Section. Our identical twin boys entered this world at just 23 weeks 4 days gestation, Cohen Lou came into this world fighting. That day we said goodbye to him as he earned his angel wings. His brother, Cooper Lee, weighing just 14.8 ounces fought for every breath. The first few days were a complete whirlwind, as no one expected him to survive. Doctors told us they were unsure what his quality of life would be if he did survive. Our faith was tested, but we never questioned that “Super Cooper” was meant to be here. He underwent four surgeries and countless other medical interventions during his time in the hospital. After 134 days in the St. Elizabeth NICU in Lincoln, Nebraska, he was able to come home. Little did we know that coming home would prove to be one of the toughest parts of our journey. Cooper came home on oxygen, an apnea monitor, and several medications. Due to being discharged at the beginning of winter and flu season, we went on lockdown for the next 7 months. This was a trying time for our family and friends. My husband and I often felt isolated, yet we knew that it was crucial for Cooper’s life for him to stay healthy. Thanks to our amazing family and friends, we were able to stay connected and persevere through it. Cooper continued to defy the odds and amaze his specialists. He was able to breathe room air within a month of being home. Within a year, he had graduated from his large list of specialists with a clean bill of health. Cooper did attend physical therapy until the age of 3 ½. Aside from small residual prematurity issues, our miracle is thriving. His weight, vision, and lungs continue to be monitored closely. He attends preschool with no specialized support and seems to learn and grow on a daily basis. Cooper spends all his time on the farm with his dad and loves to tell others about his farm adventures. He is outgoing, bright, social, and has a pure love of life. In April 2015, Cooper and Cohen became big brothers as we welcomed a full-term, healthy baby girl. Cooper adores his sister, Frannie Dawn. I often find myself recalling those dreaded words we heard about Cooper’s quality of life and. If only we could have seen what his life would hold today and be able to save ourselves many sleepless nights, tears, and worry! Our sweet angel Cohen shines through Cooper and the two of them have touched countless lives in just four short years!